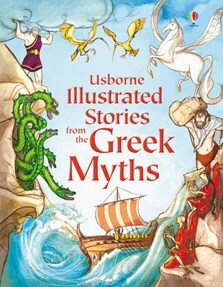 A wonderful collection of six classic Greek myths and legends, specially retold for younger readers. Includes the stories of ‘The Wooden Horse’, ‘The Minotaur’ and ‘The Odyssey’, as well as a guide to the Greek Gods. Beautifully bound in padded hardback, and packed with information, colour and culture, this makes a thrilling read for any child. With a pronunciation guide to Greek names on the Usborne Quicklinks website. There are many versions of the myths for children out there, but I was particularly wowed by the beautiful illustrations in this one. My seven year-old loved the gore... Perfect bedtime reading for the not-so-squeamish. Great for all ages, beautiful stories. Looks gorgeous on the bookshelf too. Highly recommend. Very good for young learners.